OpenMed has been presented at the 3rd edition of the UNIMED WEEK in Brussels, which was held last April 10-12 2018. The event seeks to propose a political reflection by the Euro-Mediterranean academic community on the relationships between the European Institutions and the Mediterranean region, offering an opportunity for evaluation of regional policies. Concurrently, the event allows to improve the knowledge and use of EU supported programmes, facilitating the identification of current opportunities. The UNIMED WEEK IN BRUSSELS event was attended by 75 participants from 16 countries, including 8 European countries (Austria, Belgium, Cyprus, France, Germany, Italy, Portugal and Spain) and 8 extra-EU countries (Egypt, Iraq, Jordan, Lebanon, Libya, Syria, Tunisia and Turkey). In particular, this event was attended by representatives from universities (chancellors and their deputies, academics, project managers, and so on) and associations linked to the academic world and the press, representatives of the European and international institutions, embassies and politics, and of international companies. 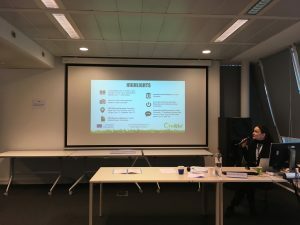 On the second day, during a meeting with the Directorate-General for Education, Youth, Sport and Culture (DG EAC), the OpenMed project was presented to the audience.